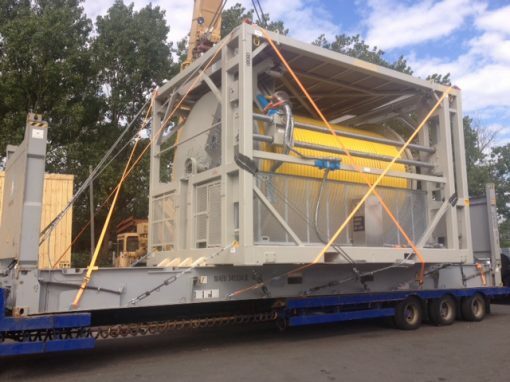 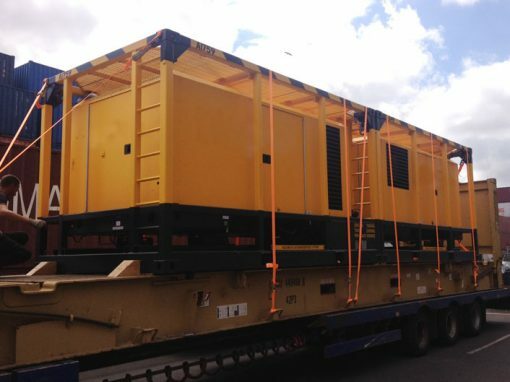 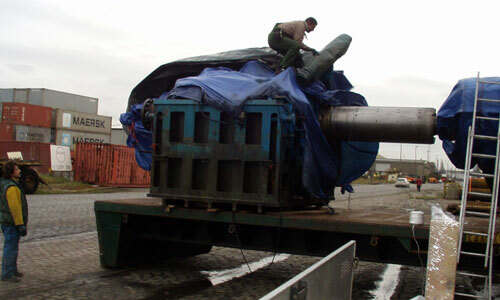 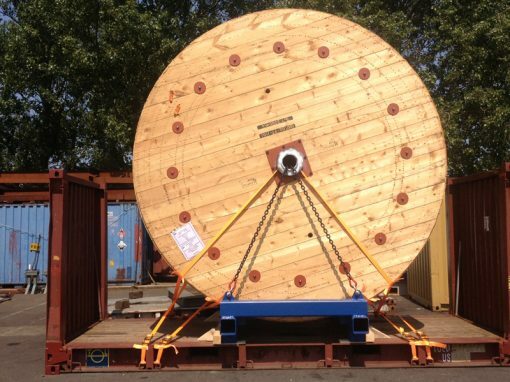 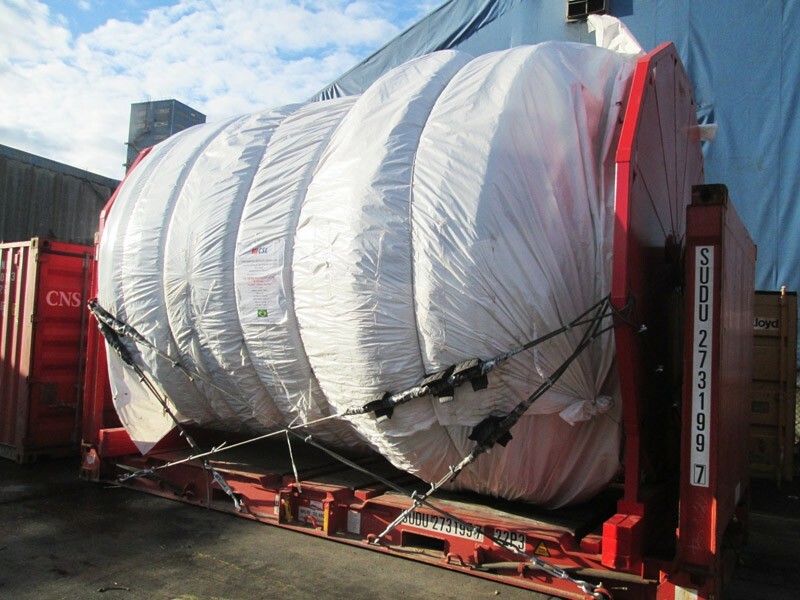 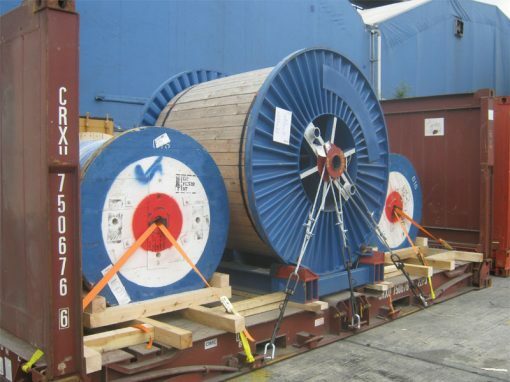 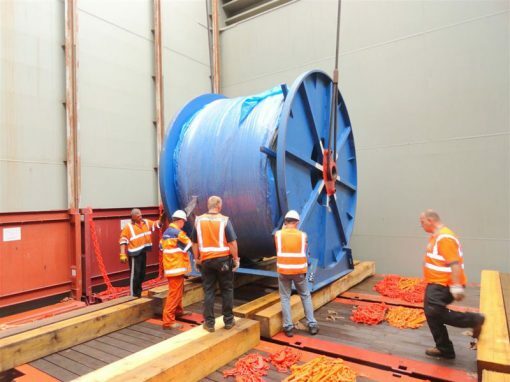 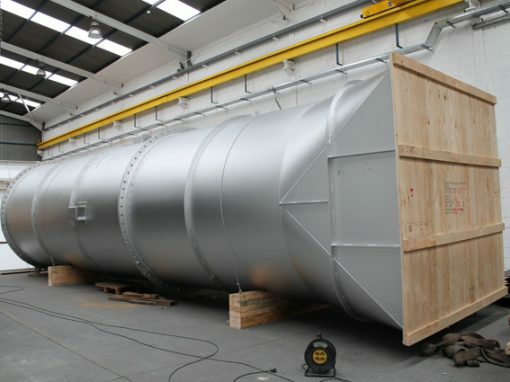 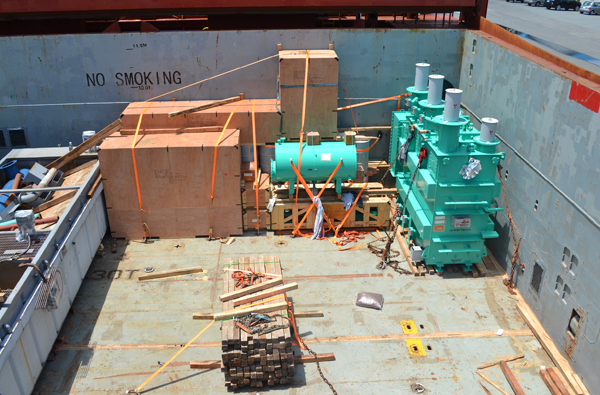 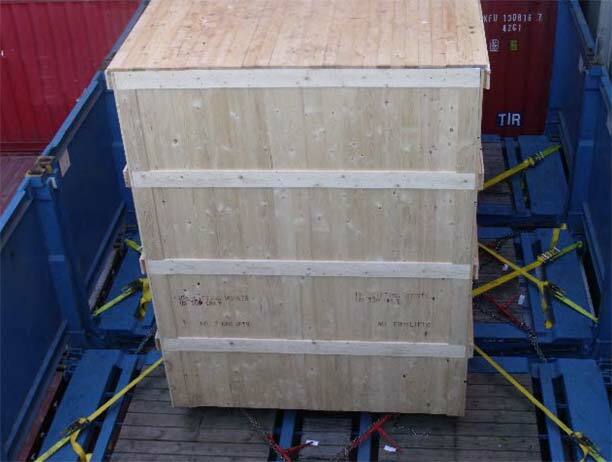 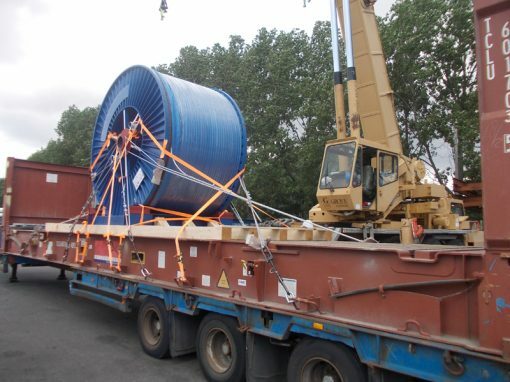 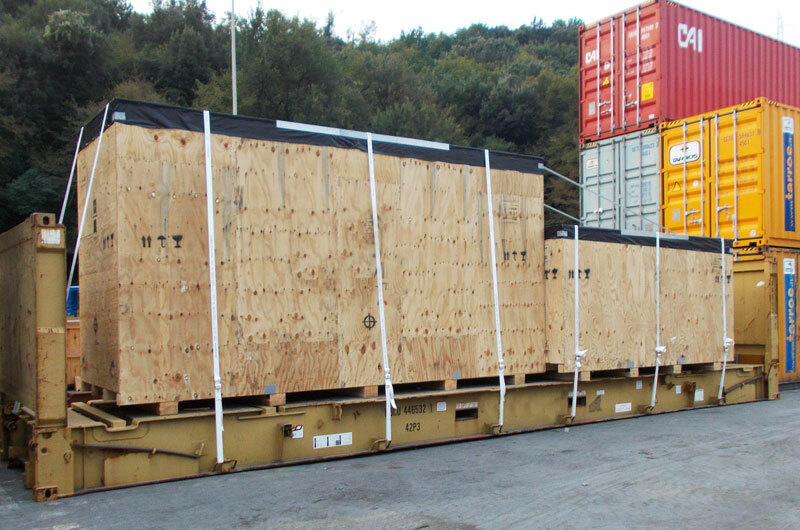 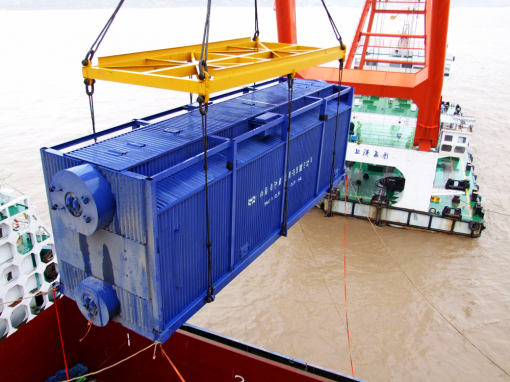 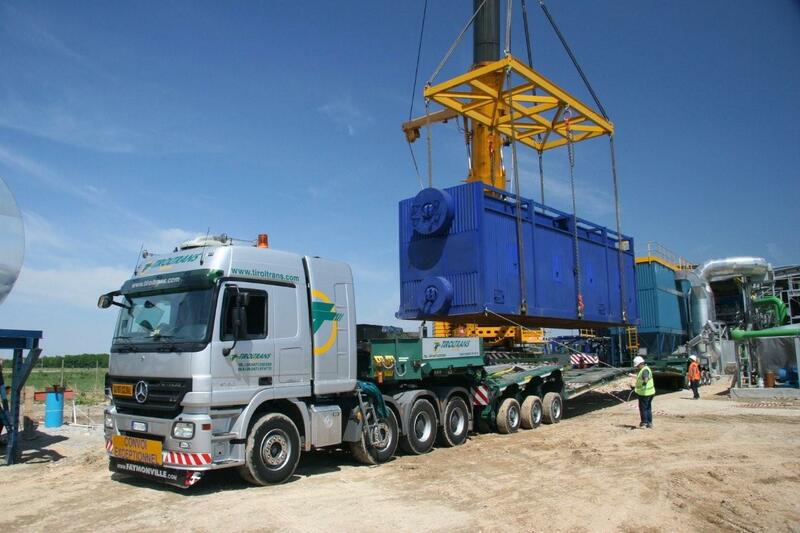 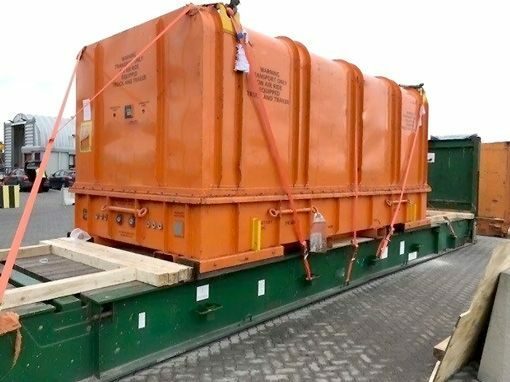 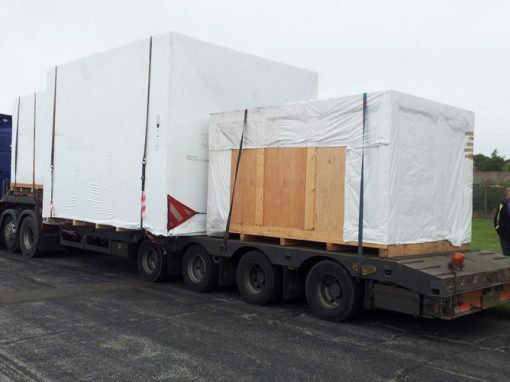 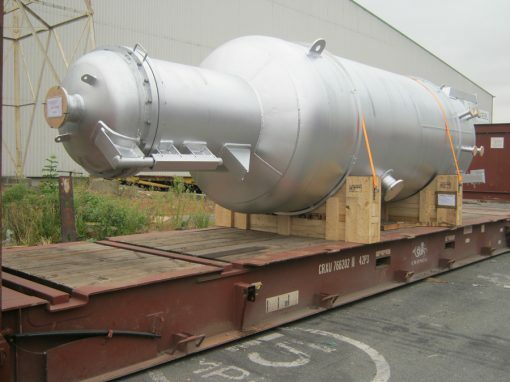 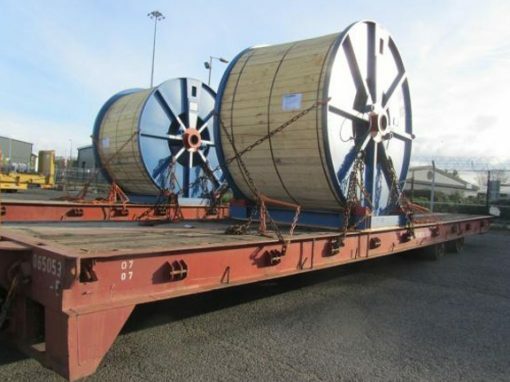 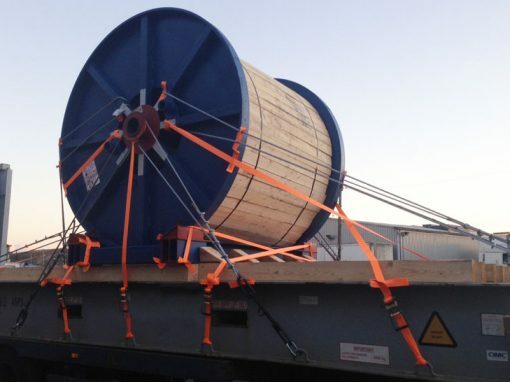 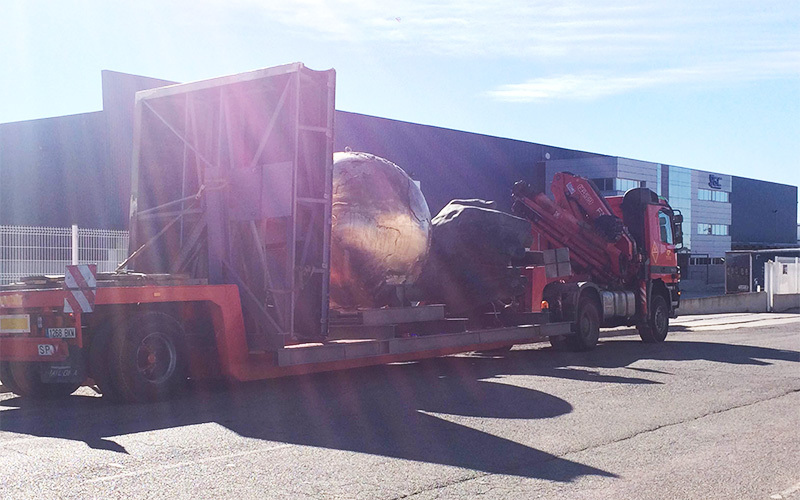 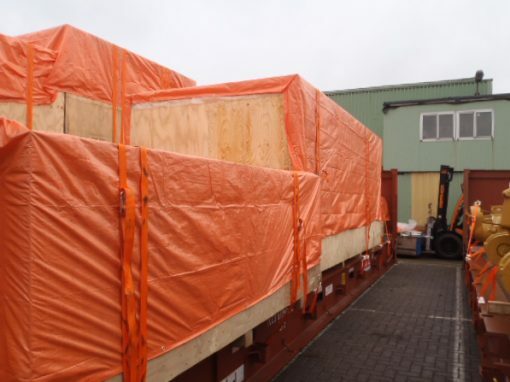 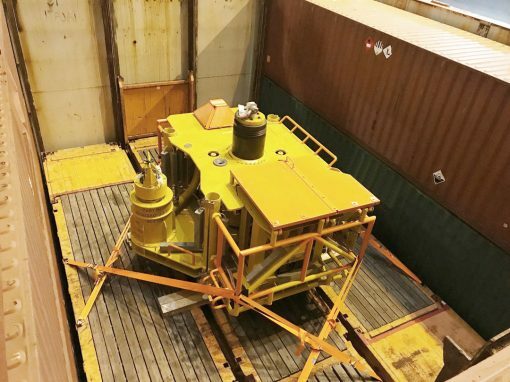 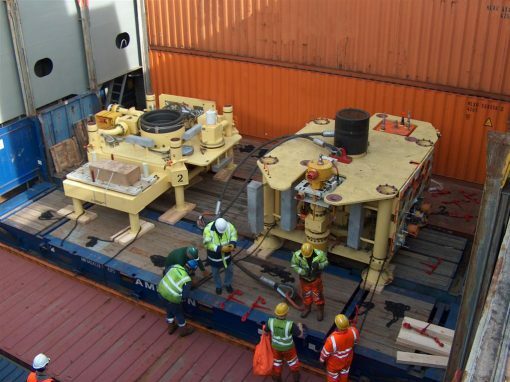 Two wooden cases containing turbo generator parts transported as separate breakbulk and out of gauge consignments, one cargo was shipped from UK to Altamira, Mexico whilst the other was transported from UK to Veracruz, Mexico. 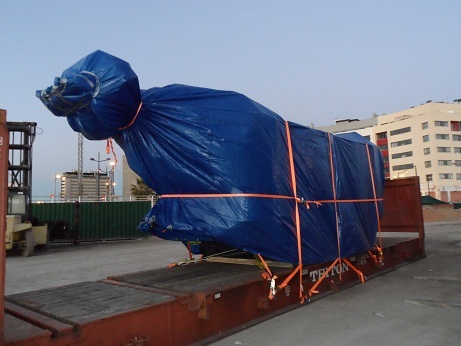 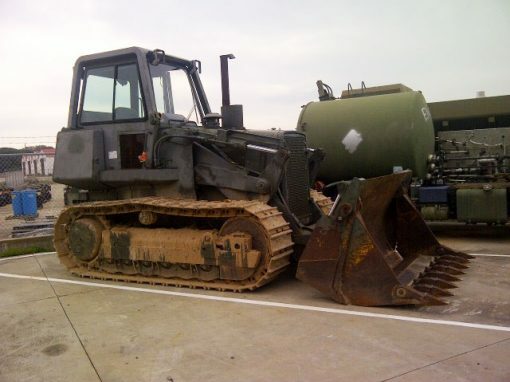 Project forwarding to Mexico is a service which Tuscor Lloyds has many years experience in. 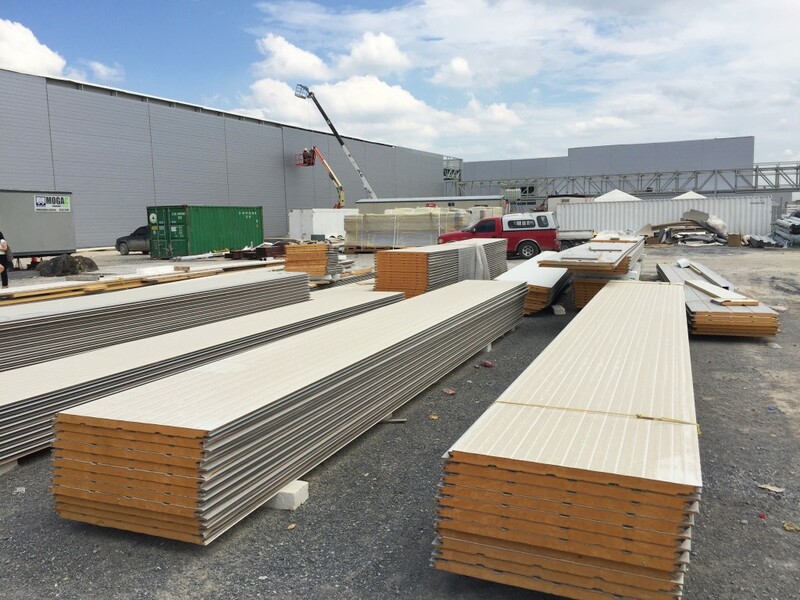 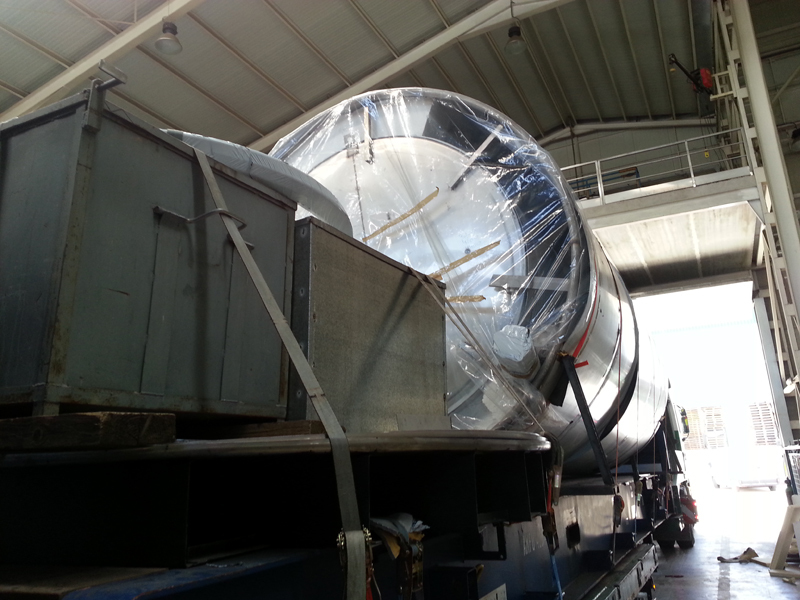 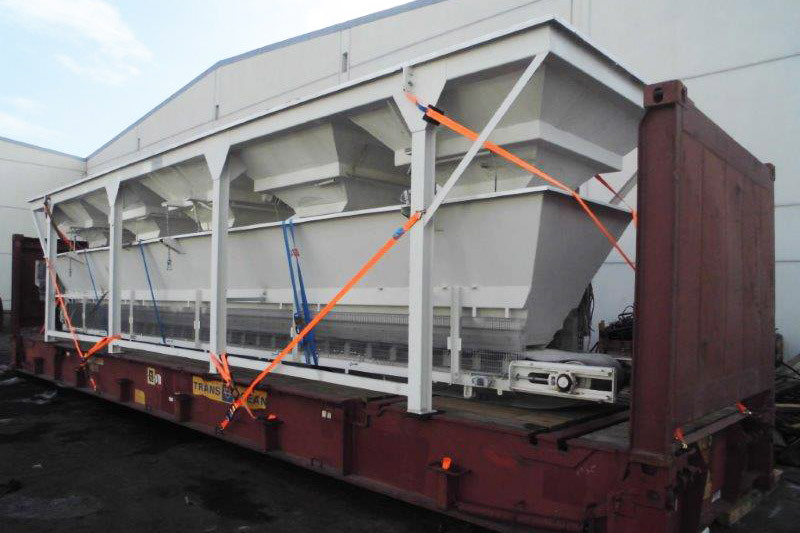 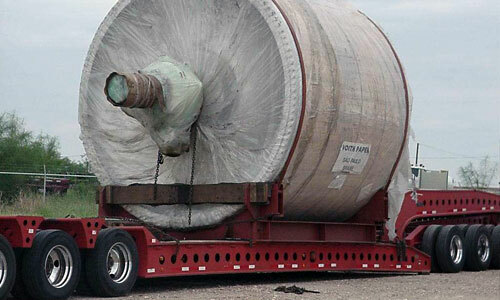 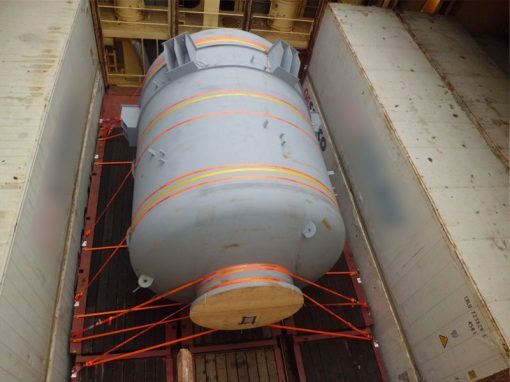 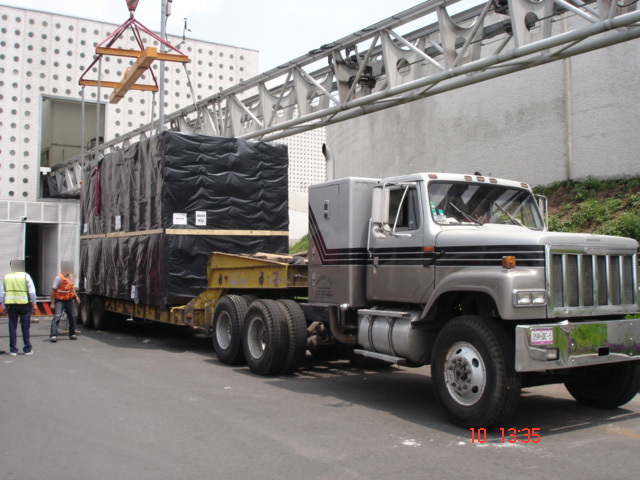 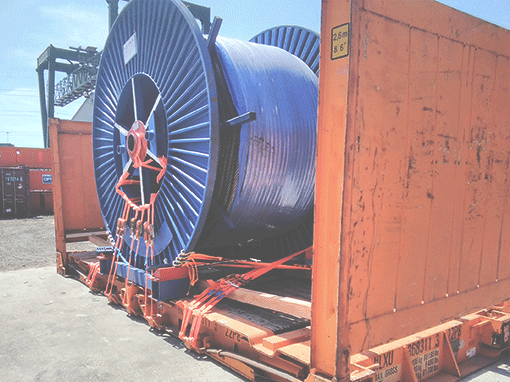 This shipment required two different delivery points from one pick-up point and was a high priority shipment due to the urgent requirement for the generators on-site at sugar refinery plants in Altamira and Veracruz. 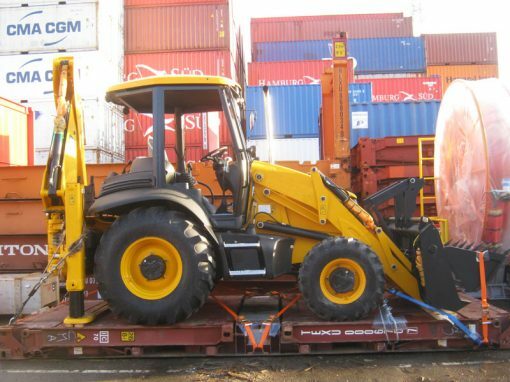 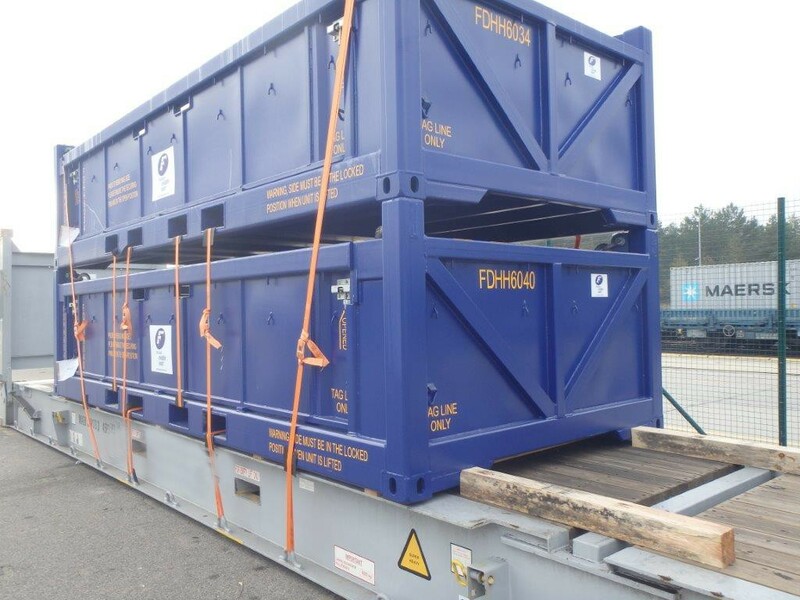 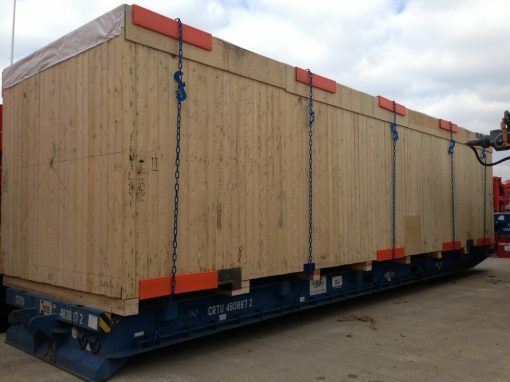 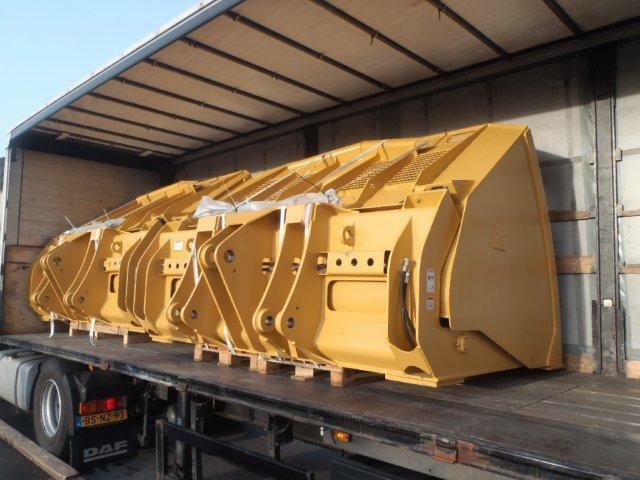 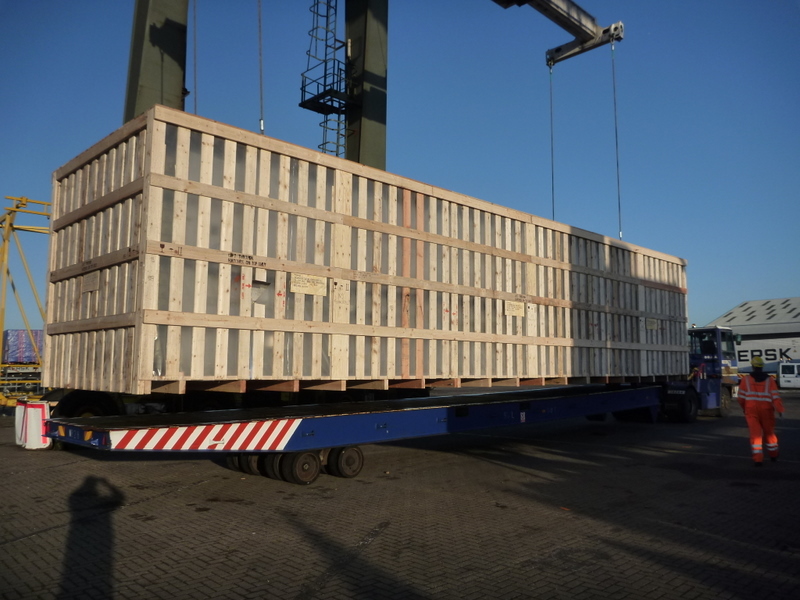 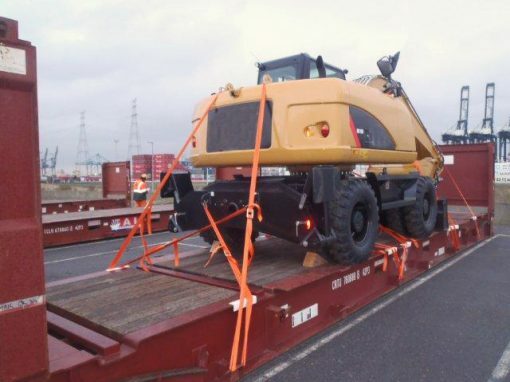 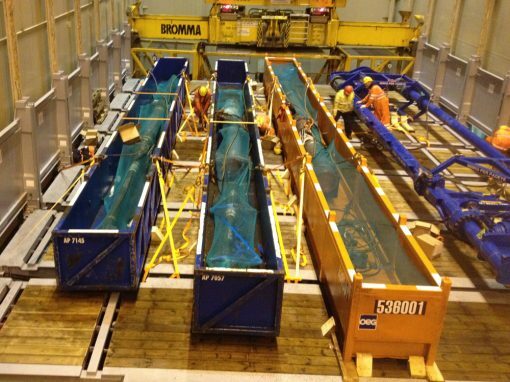 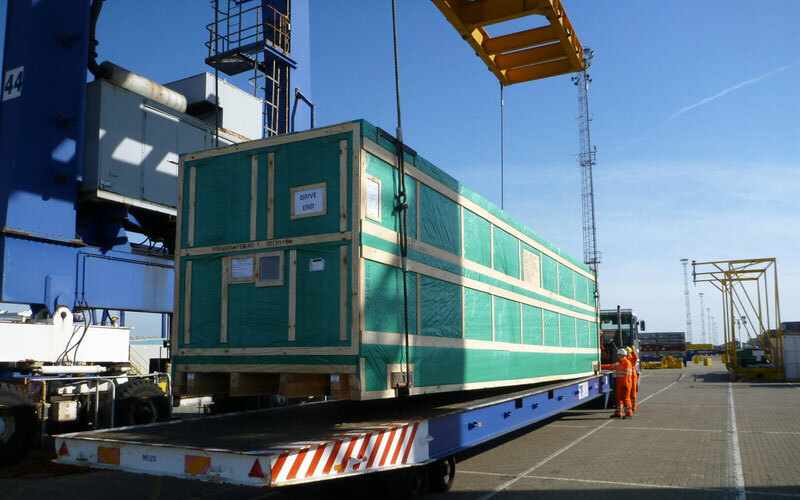 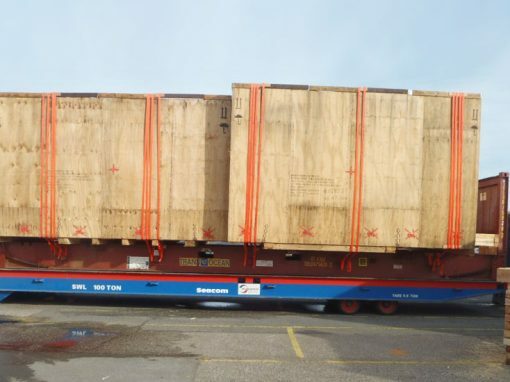 The wooden cases were picked up from the manufactures’ in Peterborough, UK and loaded onto low loader trucks for road transportation to the port of Felixstowe. 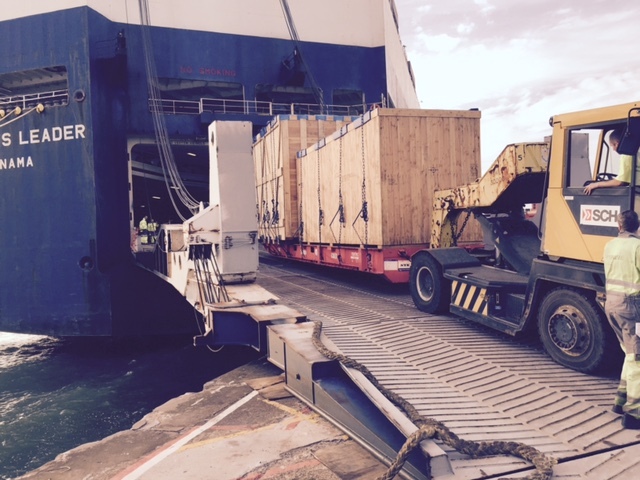 Tuscor Lloyds worked with surveyors who kept in touch with the truck drivers during the 100+ mile journey to port. 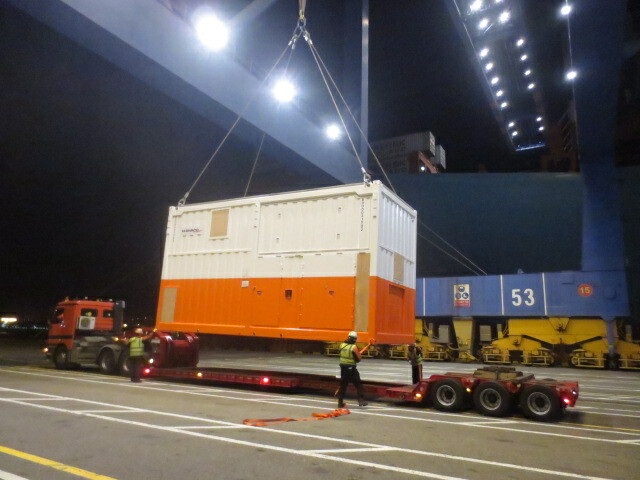 Once at port the two cases where given police escorts through the port to the Wire Lifting area. 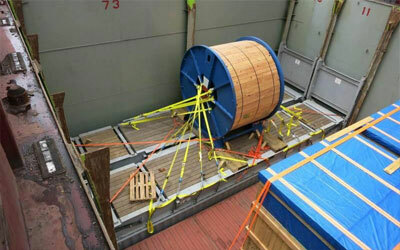 Each case was carefully lowered onto a bed of two flatrack containers and then secured using 5t webbing straps with steel wire loops through each of the securing points on each corner of the cases, these were then tensioned to the securing points of the flat racks with individual ratchets. 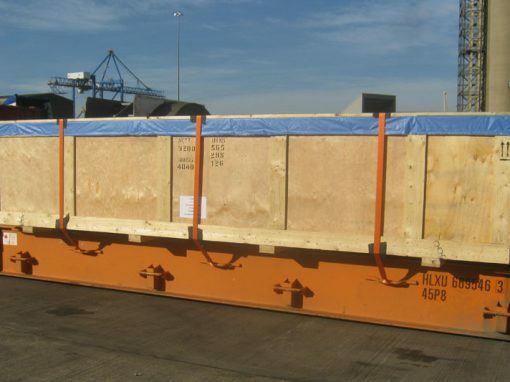 Tarpaulin was placed on top of the cases and then a further six 2t webbing straps were used along with wooden chocks to further secure the each case to the flat rack beds. 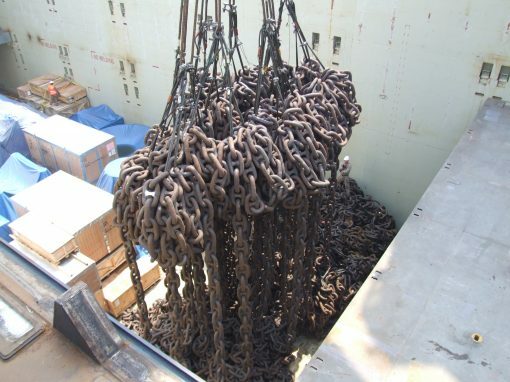 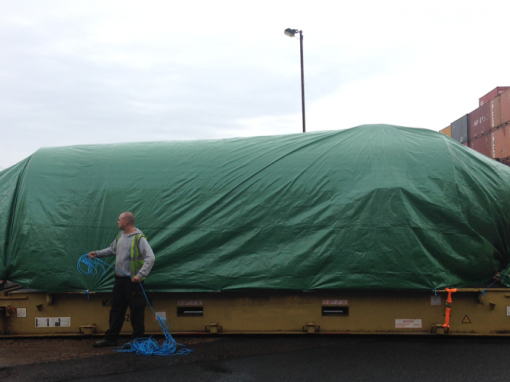 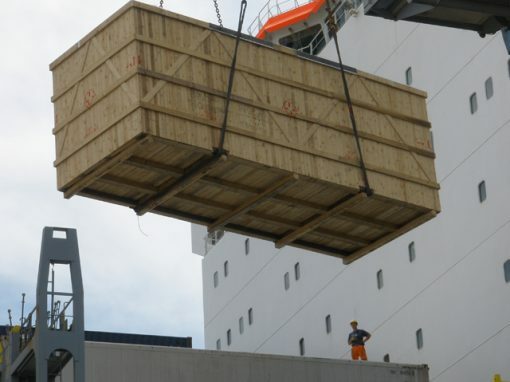 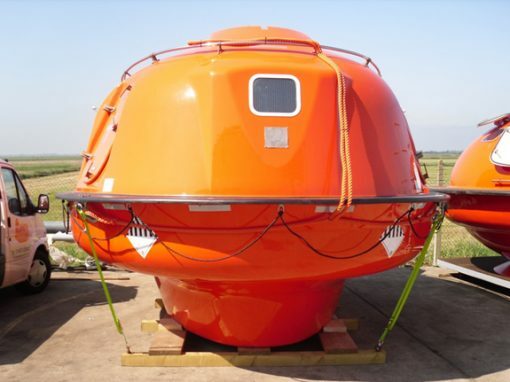 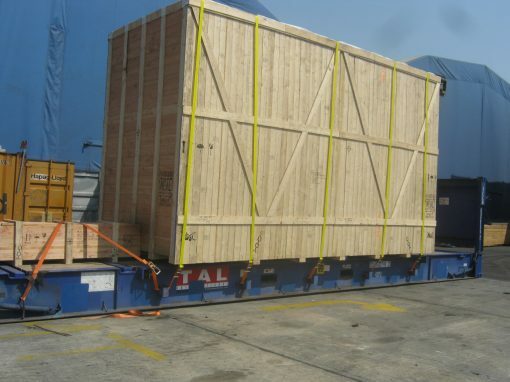 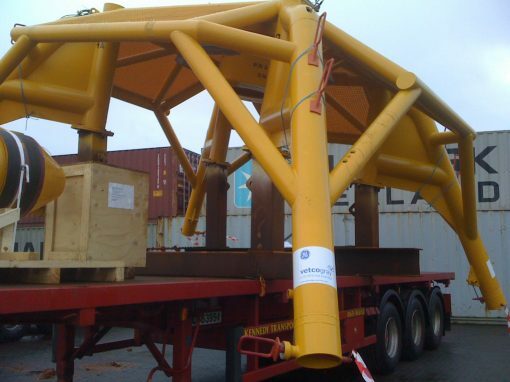 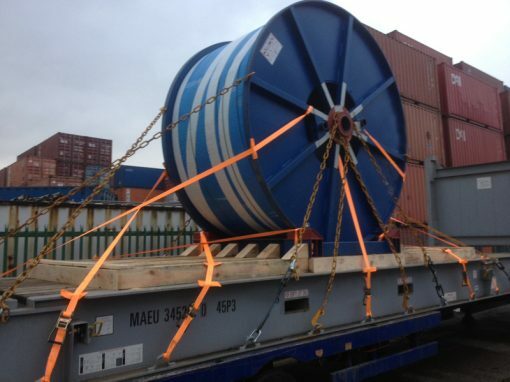 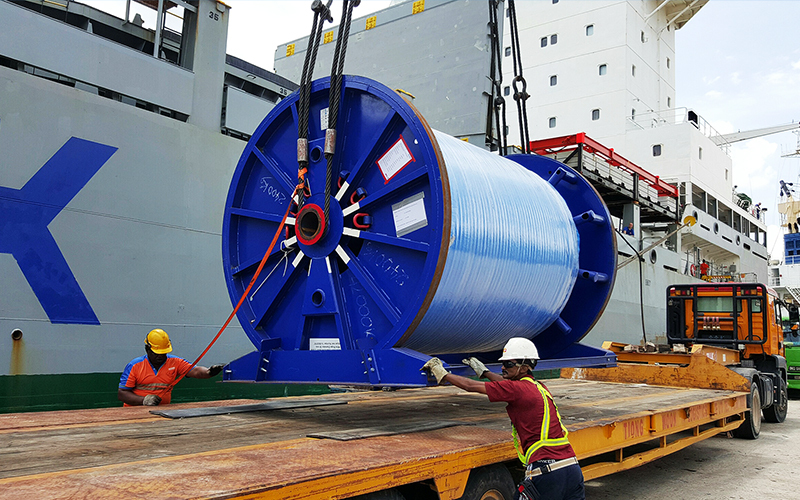 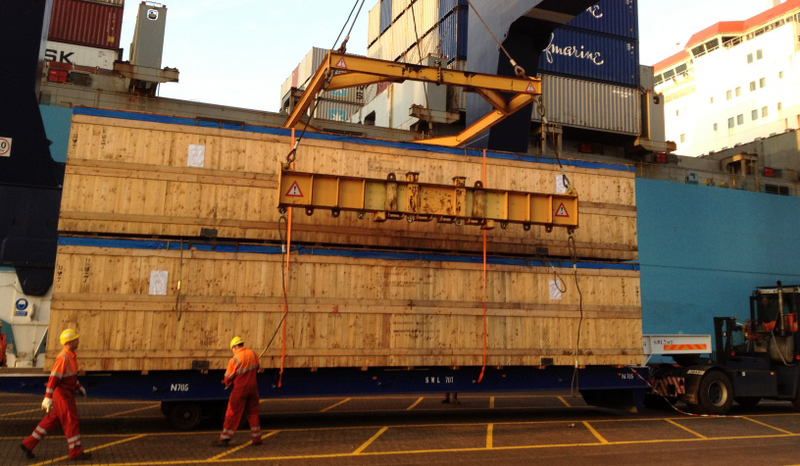 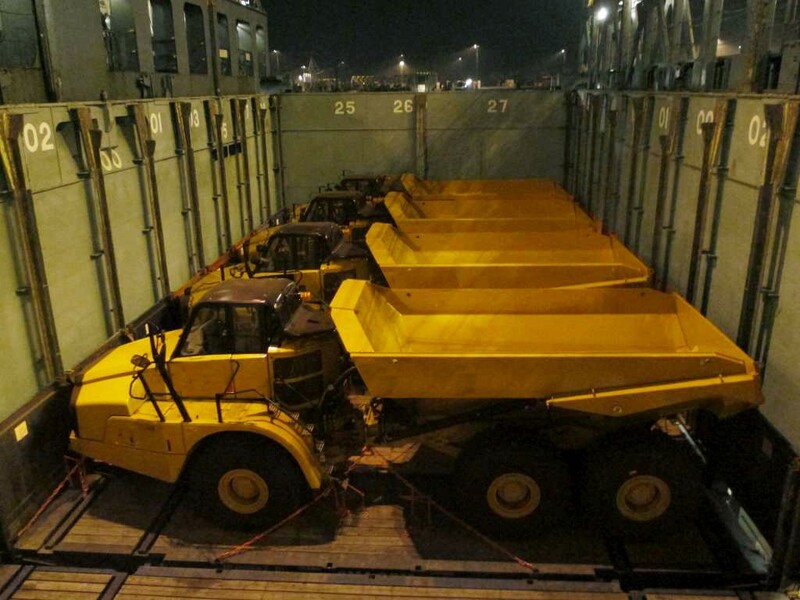 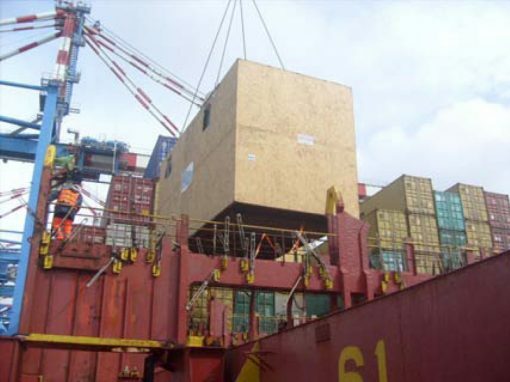 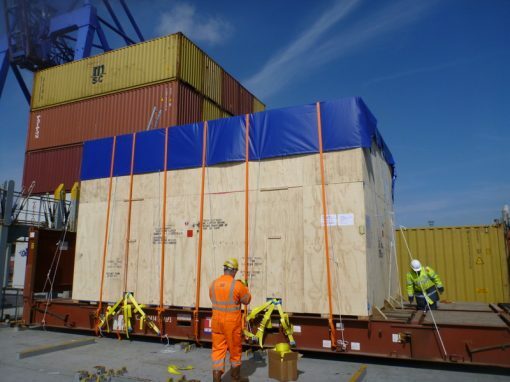 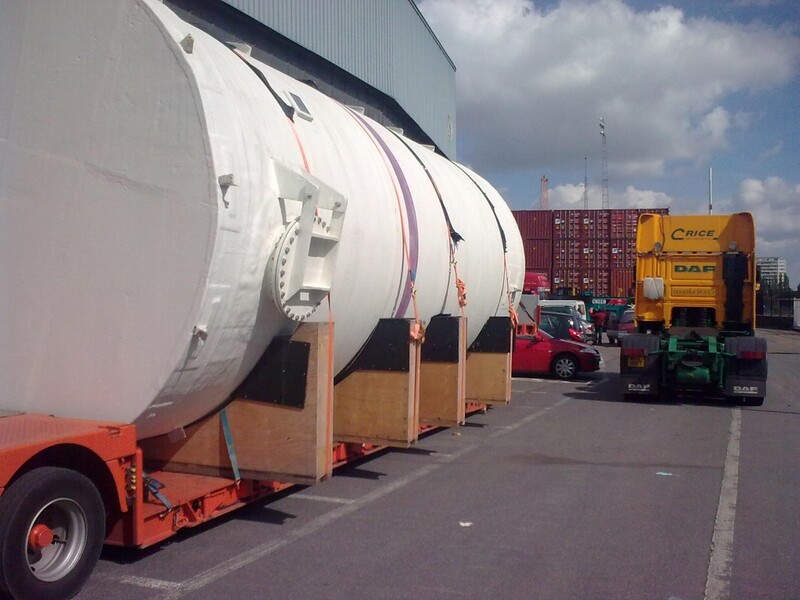 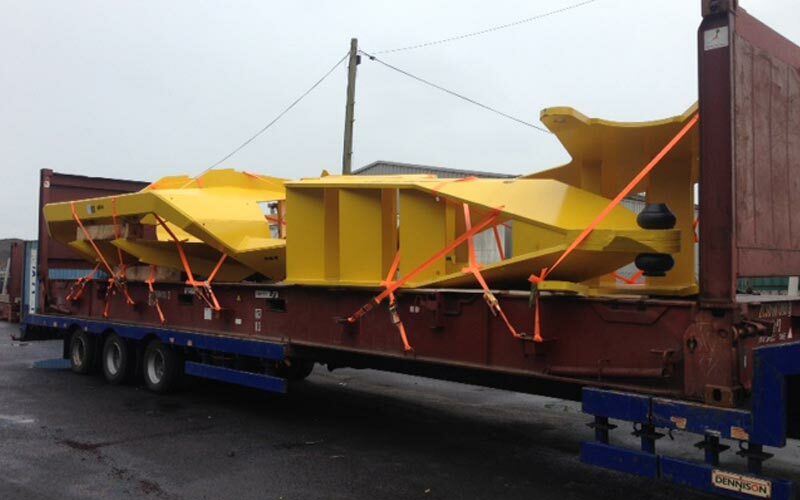 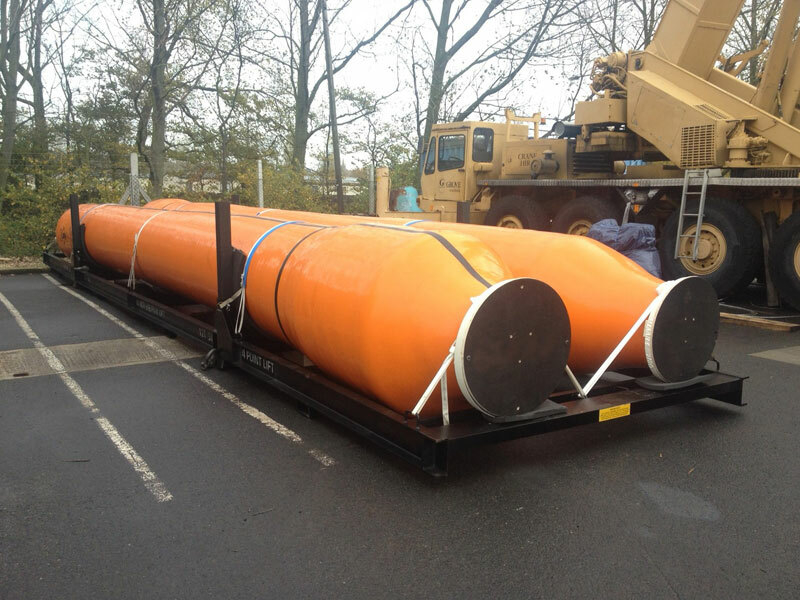 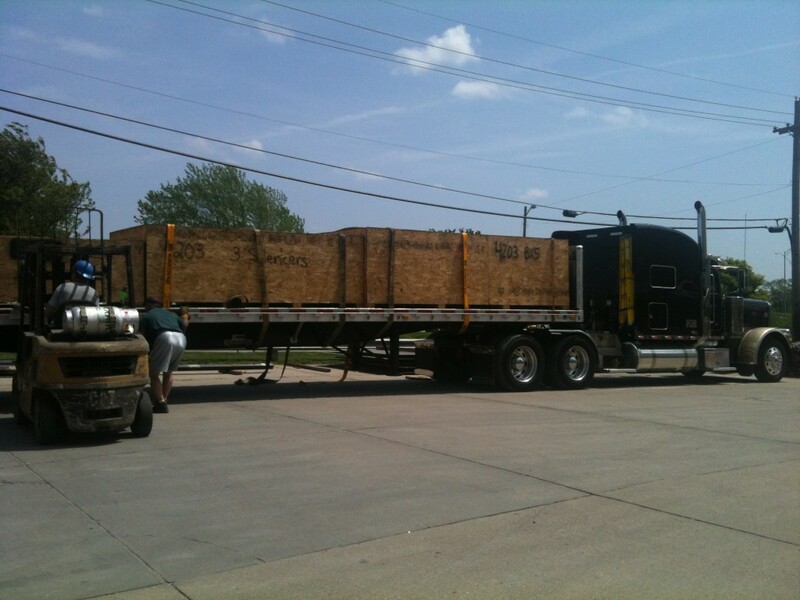 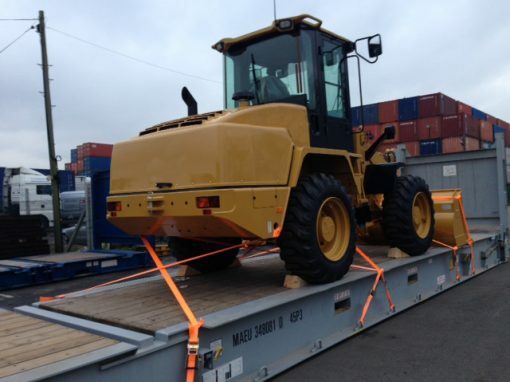 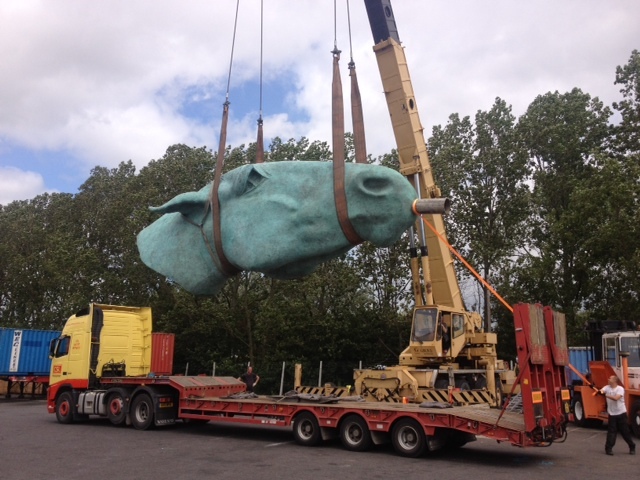 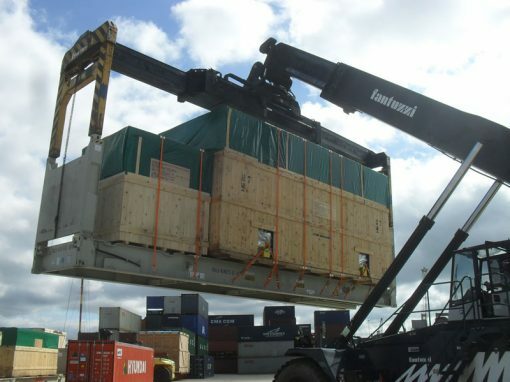 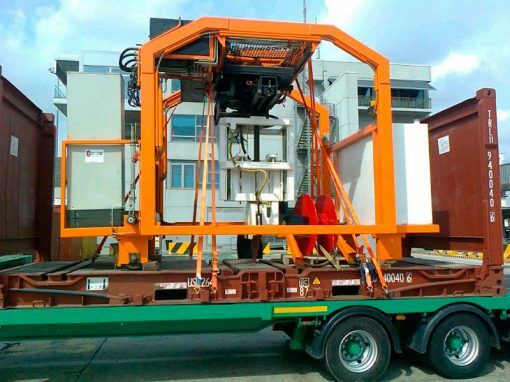 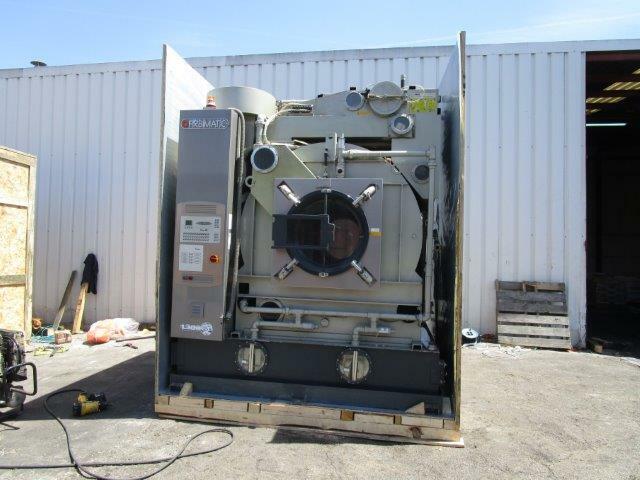 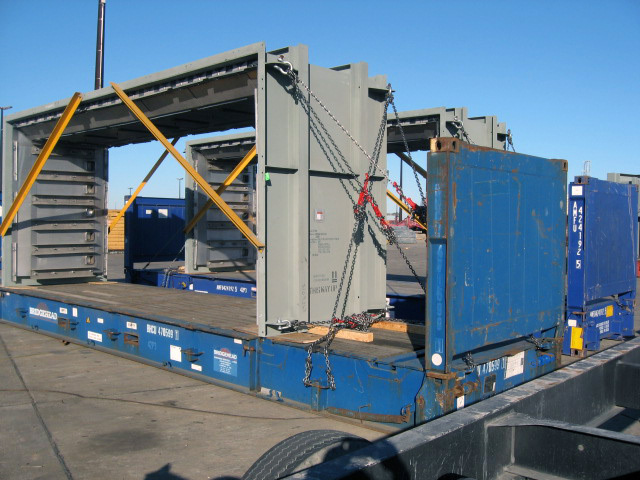 Each piece was successfully loaded onto the container vessel which set off for Mexico. 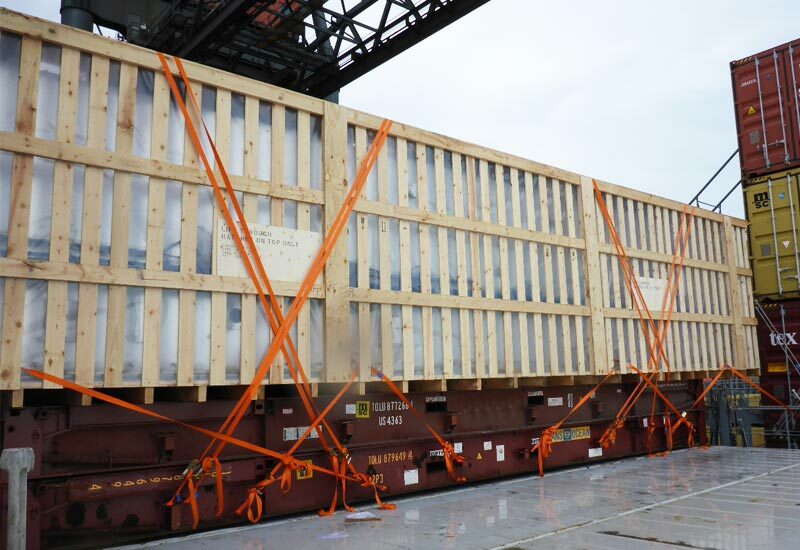 The vessel arrived at the port of Altamira after 19 days at sea and the first of the two cargoes was unloaded and loaded onto a truck for the final transportation by road. 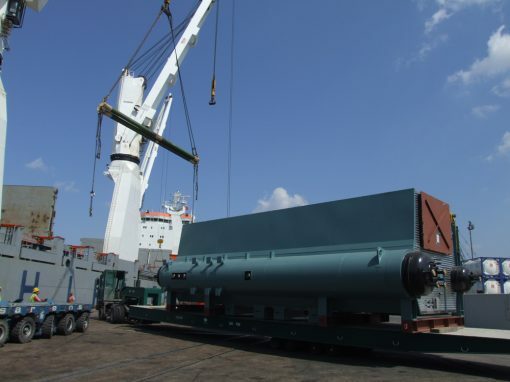 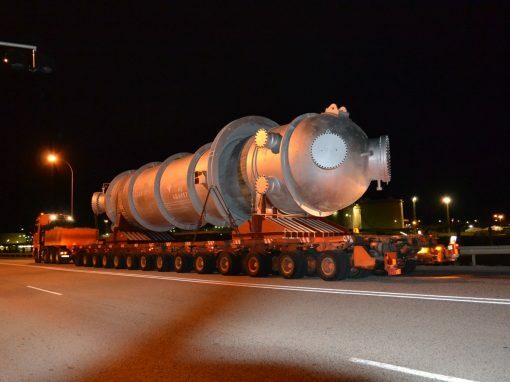 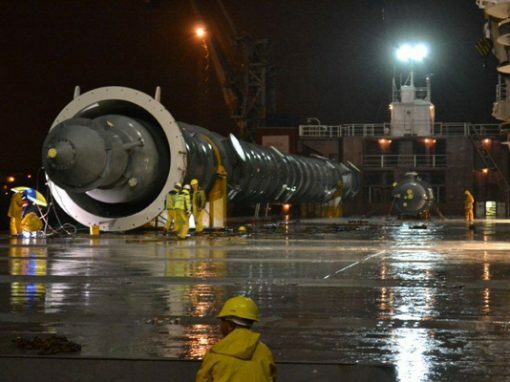 2 days later the vessel called at the port of Veracruz where the final piece was unloaded and prepared for road transportation to the sugar refinery plant just outside of Veracruz, Mexico. 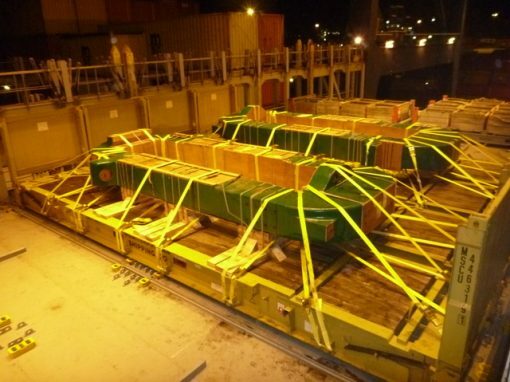 The weight of the cargoes (62.5 tons each) required them to be loaded onto maafi trailers (from the low loaders) using ship/shore cranes. 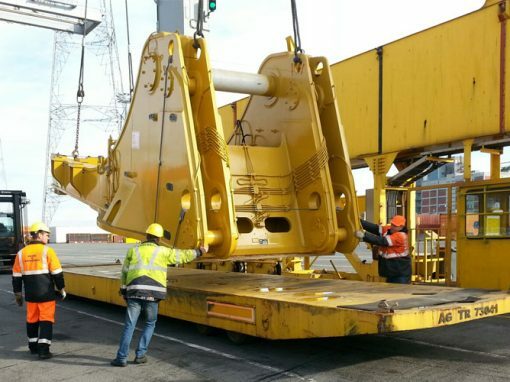 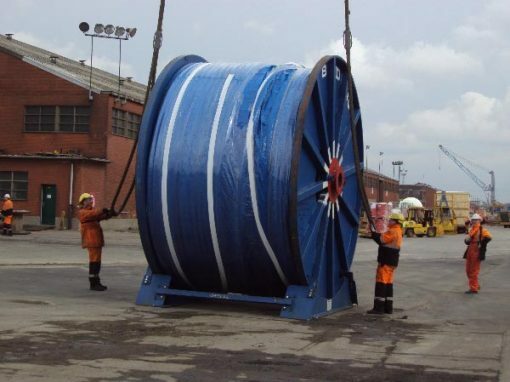 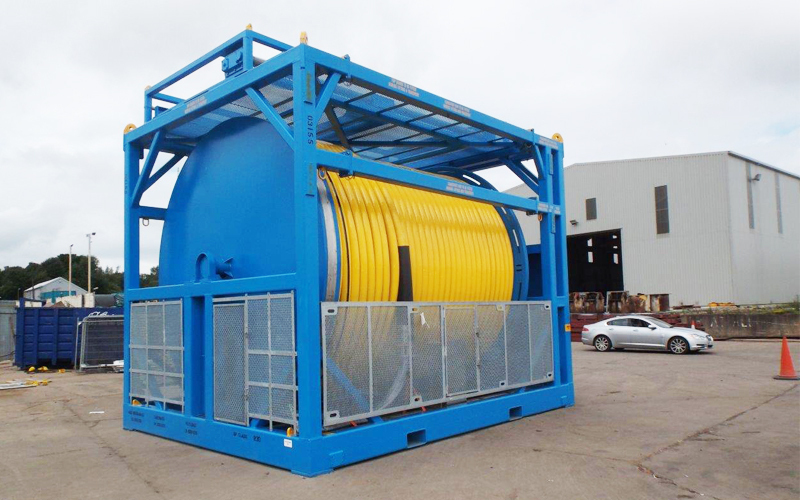 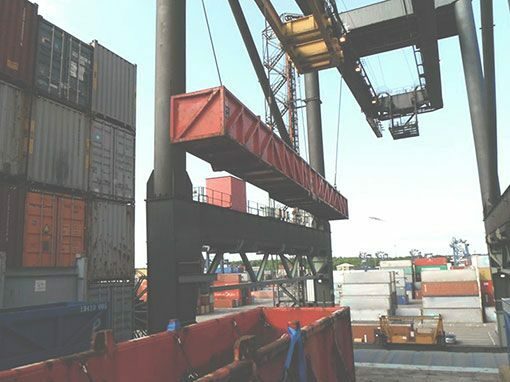 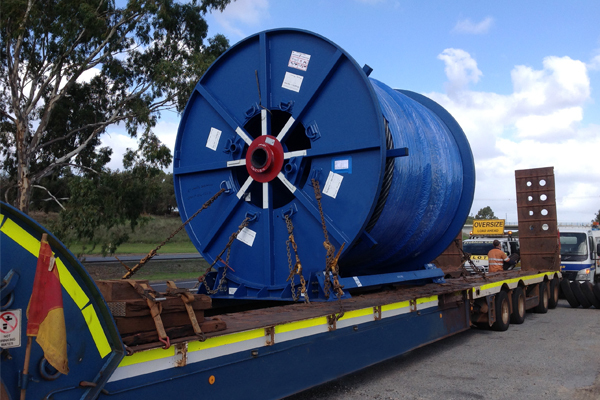 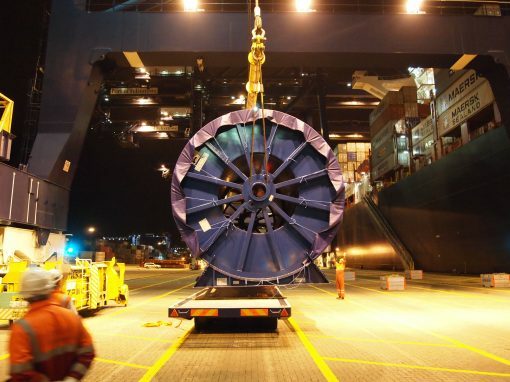 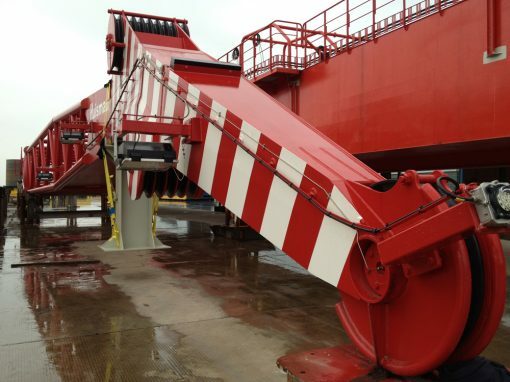 The heavy lift crane was equipped with a heavy duty swivel hook (70t capacity) attached directly onto the headblock (74t capacity) and these were positioned above four lifting wire loops. 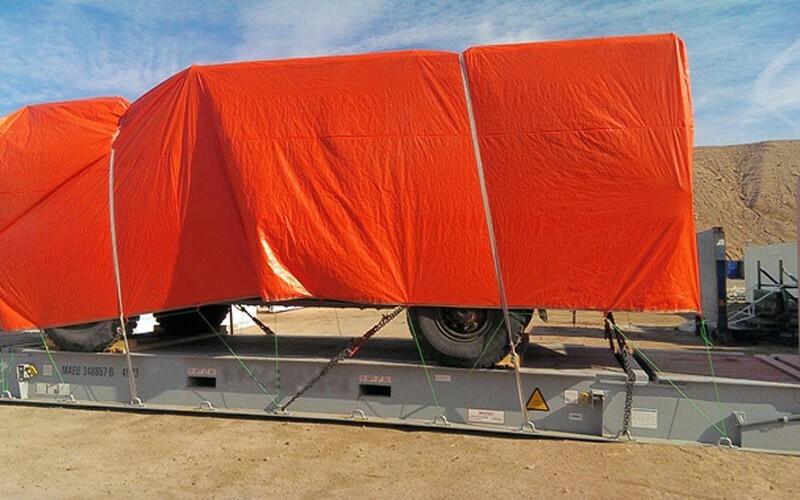 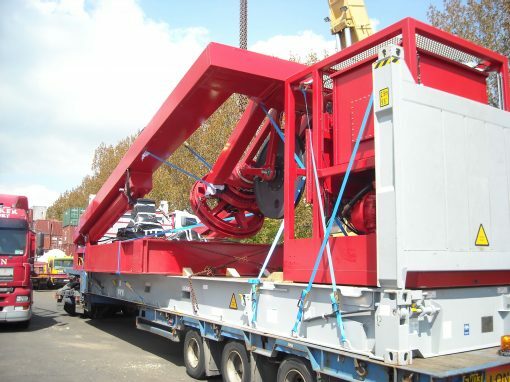 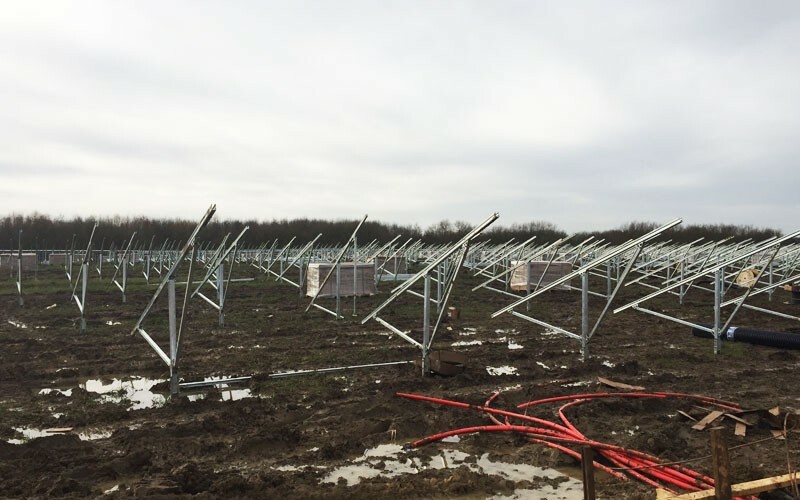 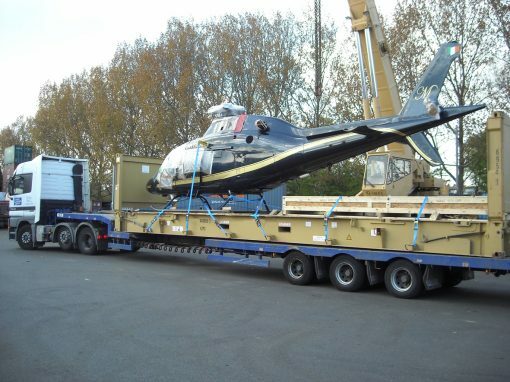 Each case was carefully lifted from the low loader trucks and positioned onto maafi trailers. 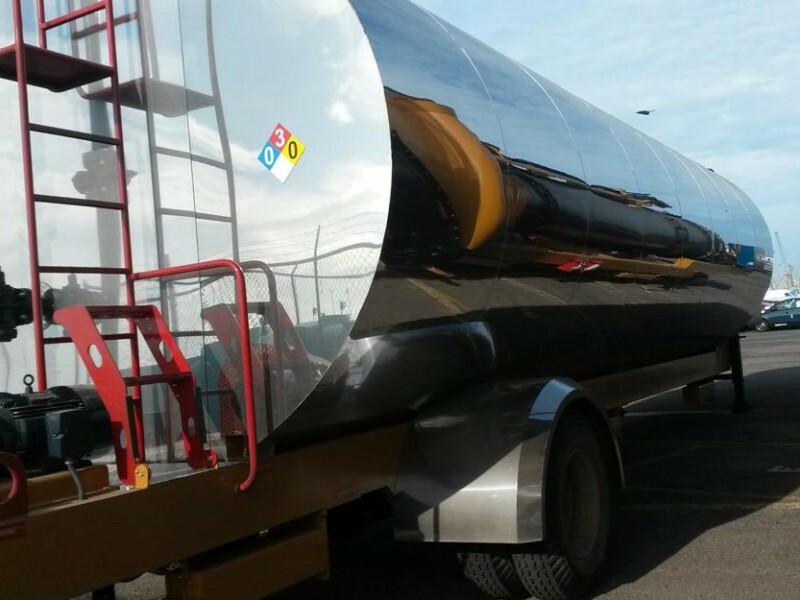 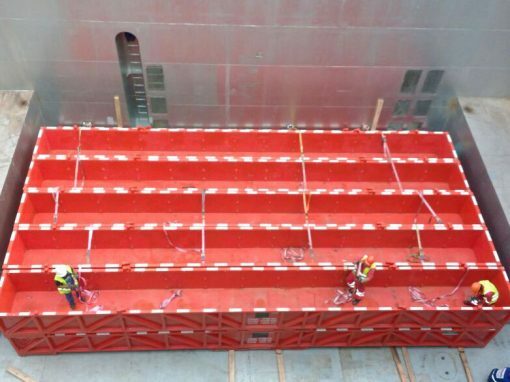 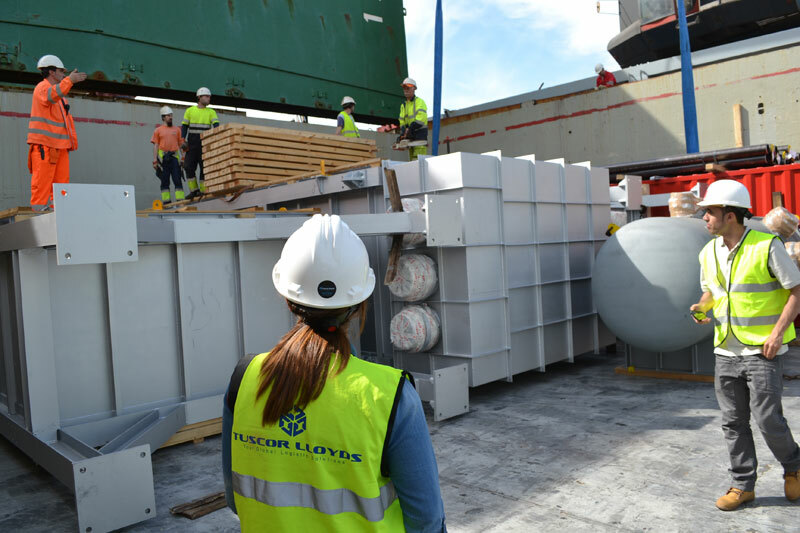 The mafi trailers were delivered quay side where flatrack containers had already been positioned on the vessel for the break bulk cases to be loaded and secured to. 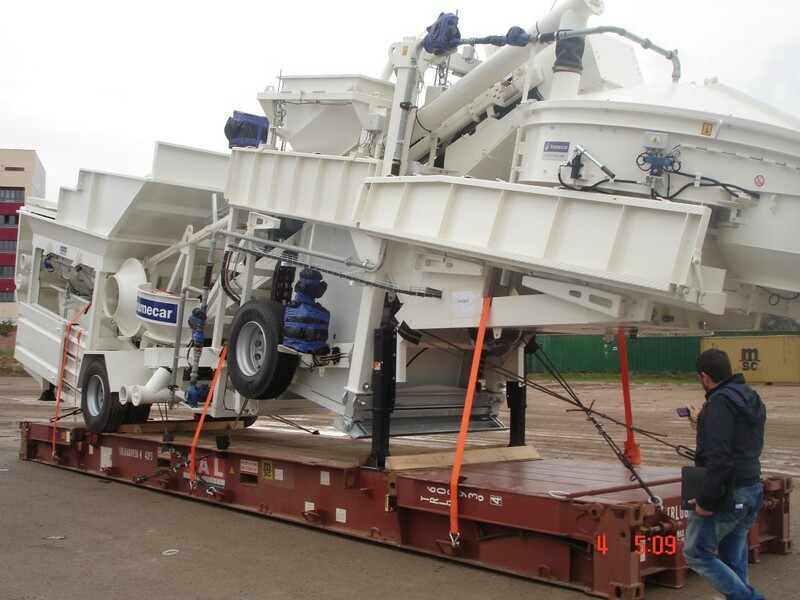 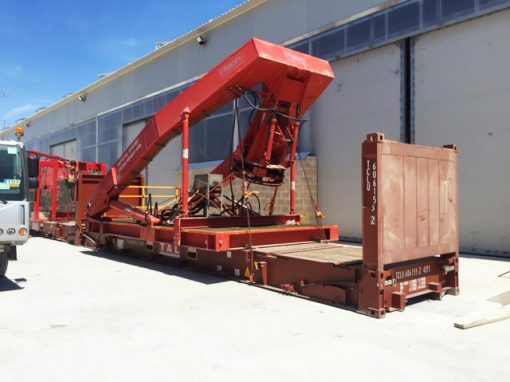 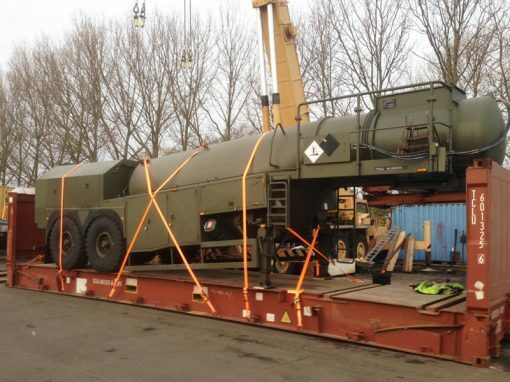 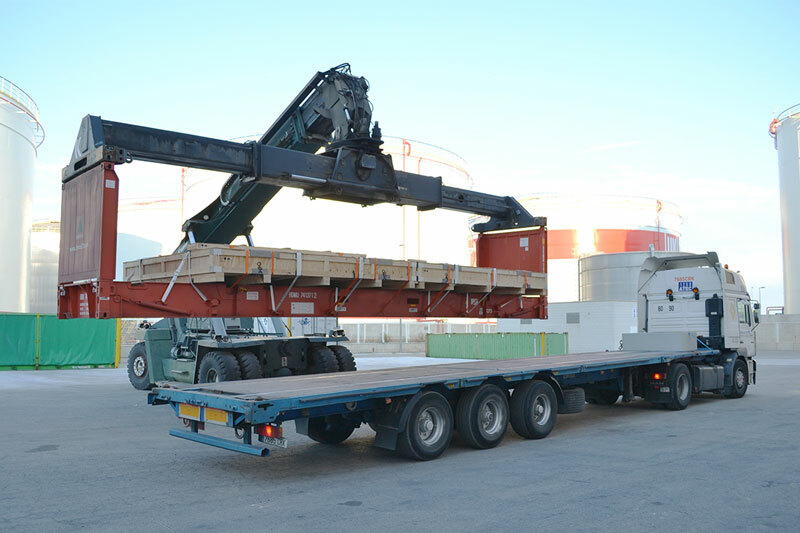 Once ready each maafi trailer was positioned for loading and lifted using the same crane system as when lifting from the low loaders to maafi trailers.